A player chooses a card from another player within range and puts it in their hand. Steal is can be used only within a player's range. Hand cards, equipment, and pending cards can all be targeted by Steal. 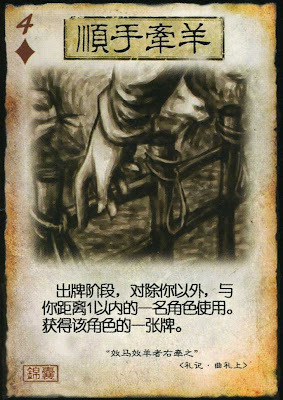 If a player steals a target's hand card, they do not get to see their hand. They just pull out a random card and put it in their hand. A player cannot use Steal on them self.